Hey guys, Trying to set my car up for grip and considering where to put my moneys. Need advice. Currently have: Coilovers Fat tyres I'm thinking of putting my money into some Cusco/Hard-race/Whiteline sway bars but I hear very conflicting views, people saying they're a good bang for buck and others saying the stock ones are good enough. or should I Invest in front and rear suspension, i.e; Caster arms, Lower control arms, Toe arms, Camber arms and traction arms although I wouldn't be sure how to set them up. Finally getting wheels/tyres & coilovers. Going with mca blues for many reasons. (not sure what spring rate to run but they have amazing support so they'll give me a hand with that) I'm getting: 18 x 8.5 +32 front (may run 10mm spacer) 18 x 9.5 + 30 rears I would go a lesser offset on my fronts but new D9rs don't come with my preferred offset. I also know these are very conservative sizes, I want my wheels to fit well in the guard with no scrubbing. Want to be able to drive my car hard, all about function. I don't know anything about tyres, Please help me out. Want a lot of tyre on the road but i'm not sure about running semi sliks. Still have that vertex rear bar mate? Spotto replied to Spotto's topic in New Member Introductions! Yeah I wasn't fussed with which Spec I was going to pick from although I did need it to be a 200sx. 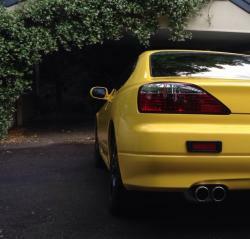 As Michael said i was missing out on a sunroof, the spec R badge and aero skirts which didn't bother me the slightest. As for it being yellow, I had my heart set on a yellow one as soon as one drove past me and I do think it's a very acquired taste. Thanks mate. Start off small doing just the sound system, already got a head unit just going to neatly fit an amp and sub in the boot followed by speakers in the doors and behind the back seats. Put a nice set of wheels on it when my current tread runs out, thinking ENKEI PF01EVO rims but finding the perfect match for a yellow car isn't easy. Keep it as untouched as I can for as long as I can, probably wont be changing its stocky look. It's also got an Xforce full exhaust system which gives it a nice tone. Will refrain from any engine mods as I get to know the car better, had a good time sliding in the wet tonight . If you've got any tips for the sound system would really appreciate it (whats your setup? ), hopefully get that in the car asap. Spotto posted a topic in New Member Introductions! Hey guys, Just bought my dream car last week and loving every moment, can't stop giving it constant attention and using every excuse to drive it around at the moment. Can't wait to meet up with some of you guys from NSW. Would be sweet if I could take that turbo timer off your hands, you're pretty close to me. Whats your number? Hey guys, Just heard a new rubbing noise similar to that of your tires rubbing on it's arches after I stalled it. After the research i've done and testing variables while driving it seems i may be in need of new wheel bearings or just a re-alignment. Before I take it to my mechanic I thought I might see if theres an easy fix. The sound is coming from the front right side of the car which leads me to believe it's the steering. The car isn't low enough whilst sitting on stock rims and semi-new tires, so there is no rubbing in the arches. Any ideas?